Apple has finally announced its upcoming iOS 5.0 firmware version for Mac and iDevices at annual WWDC event. Steve Jobs holds the mike to announce the new flagship of software suites for Mac and iDevices, Apple announced that to date, they have had more than 14 billion downloads, with over 90,000 iPad apps. They have paid developers more than $2.5 billion dollars so far. Apple started off the new feature list with notifications. Apple has removed the old notification popup system for a more inline notification system, making it less annoying when you're watching a video or playing a game. The 'notification center' will act similar to Android, where your menu swipes down, revealing alerts for all of your phone, messages, emails and more. The notification center is even on your lock screen too. The lock screen has received a major update, allowing for notifications from apps, messages, and even listening to voice mail without having to slide to unlock the phone. iOS 5.0 also comes with 'Newsstand', a new subscription-based application that has a ton of newspaper and magazine companies on board, including New York Times, SF Chronicle, Daily Telegraph, and more. Much rumored beforehand, Apple has introduced Twitter natively into iOS 5, with a 'one click' option for applications to let you use Twitter functionality. All you'll need to do is sign in through the Settings menu and any app can request integration with your Twitter account, meaning no more constant signing in to every new application you download. It's also fully integrated with the Camera and Photo apps, for example. You can also tweet articles from Safari and locations from Maps. A new reading mode has been introduced in Safari, which removes distraction and provides you with a single, scrolling story. Bye bye, ads! You can now also email the contents of the story as well as the link. There's also a Reading List option so you can save stuff to look at later. We bet Read It Later and Instapaper are well chuffed about that. There's also tabbed browsing and lightning-fast window switching. 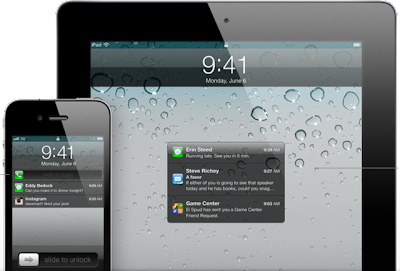 A reminders feature enables you to store Lists, assign reminders to any dates or even location-specific info. 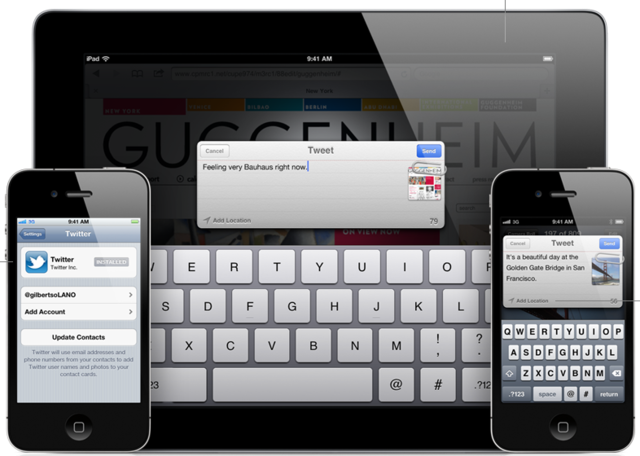 These sync across devices and with iCal. There's now a camera button on the lock screen, while you can also use the volume button to take pictures - a great addition. Apple says its camera is one of the most commonly used pieces of hardware on photo-sharing sites like Flickr, and has updated the functionality accordingly. Photo editing software for easy cropping and enhancement has been added in to iOS 5, and pinching to zoom will zoom in on images when you're trying to take a pic. The app now has new elements like draggable addresses so you can pop them across from To to Cc or Bcc. Flagging and full-searchable messages have been added in too, plus rich text formatting for easier interaction with your e-mails. A built in dictionary makes it easier to keep your spelling under control, and for the iPad: a split keyboard. Simply grabbing it with your thumbs and sliding upwards will split it in two, making it easier to tap out emails more speedily. Game Center now lets you browse and download games directly, as well as introducing Achievementpoints, There's also Friend Discovery. Gamer profiles have been updated to include photos as well, plus turn-based gaming is baked right into the application for more responsive gaming. Last up, Apple introduced iMessage. 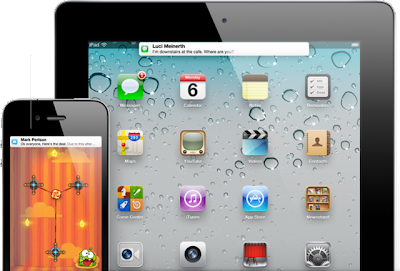 The new instant messaging service allows any iDevice (iPhone, iPod touch and iPad) to communicate with each other. The new application is very similar to the SMS application, but is completely free. Similar to BBM (BlackBerry Messenger), the application allows you and your friends to instant message one another, from anywhere in the world, without the added roaming charges. iMessage requires WiFi or 3G to send and receive. iOS 5.0 will ship this fall to consumers.